Donald Trump is zeroing in on national security, foreign policy and America’s military. The Union League of Philadelphia has roughly 3,000 members, according to the Associated Press, and began in 1862 in support of President Abraham Lincoln and the Union. “She’s trigger happy and very unstable,” the New Yorker stated of Clinton, also calling her “reckless” over her use of a personal server with classified emails during her time as secretary of state. Trump criticized Clinton’s handling of Libya, Syria, ISIS and Iran. “What have we gotten from the horrible decisions made from President Obama and Secretary Clinton?” Trump questioned. An NBC News|SurveyMonkey Weekly Election Tracking poll published early Wednesday showed that voters who currently serve in the military or previously served prefer Trump over Clinton by 19 points. 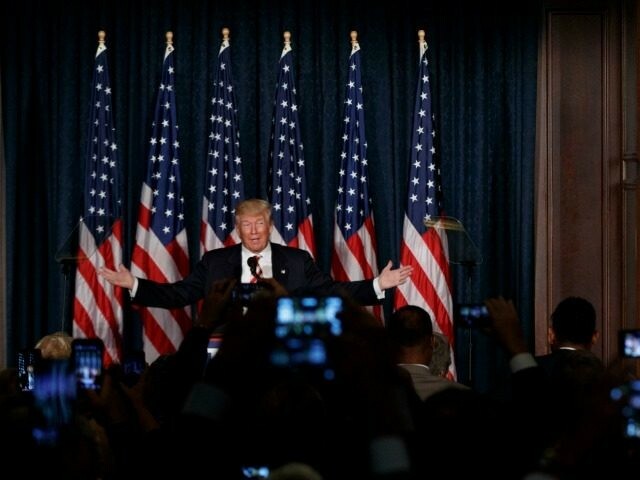 The Republican nominee laid out several proposals in a campaign press release ahead of his speech about how to “update and upgrade” the U.S. military. PROPOSAL: Immediately after taking office, Mr. Trump will ask the generals to present a plan within 30 days to defeat and destroy ISIS. PROPOSAL: Mr. Trump will ask Congress to fully eliminate the defense sequester and will submit a new budget to rebuild our military as soon as he assumes office. PROPOSAL: Mr. Trump will build an active Army of around 540,000, as the Army’s chief of staff has said he needs. PROPOSAL: Mr. Trump will build a Marine Corps based on 36 battalions, which the Heritage Foundation notes is the minimum needed to deal with major contingencies. PROPOSAL: Mr. Trump will build a Navy approaching 350 surface ships and submarines, as recommended by the bipartisan National Defense Panel. PROPOSAL: Mr. Trump will build an Air Force of at least 1,200 fighter aircraft, which the Heritage Foundation has shown to be needed to execute current missions. PROPOSAL: Mr. Trump will seek to develop a state of the art missile defense system. PROPOSAL: Mr. Trump will modernize our nation’s naval cruisers to provide Ballistic Missile Defense capabilities. PROPOSAL: Mr. Trump will enforce all classification rules, and enforce all laws relating to the handling of classified information. PROPOSAL: One of Mr. Trump’s first commands after taking office will be asking the Joint Chiefs of Staff, and all relevant federal departments, to conduct a thorough review of United States cyber defenses and identify all vulnerabilities – in our power grid, our communications systems, and all vital infrastructure. NBC News is hosting Trump and Clinton in a Commander-in-Chief forum on Wednesday at 8 p.m. They will answer questions on military affairs, veterans issues and national security.